Although marketing proposals are often several pages long, it doesn’t have to take you hours to create one. When you niche down and work with a specific industry, you can create a marketing proposal template that speaks directly to them. Then, whenever you need to create a new marketing proposal, it’s simply a matter of filling in the blanks and customizing your template for them. 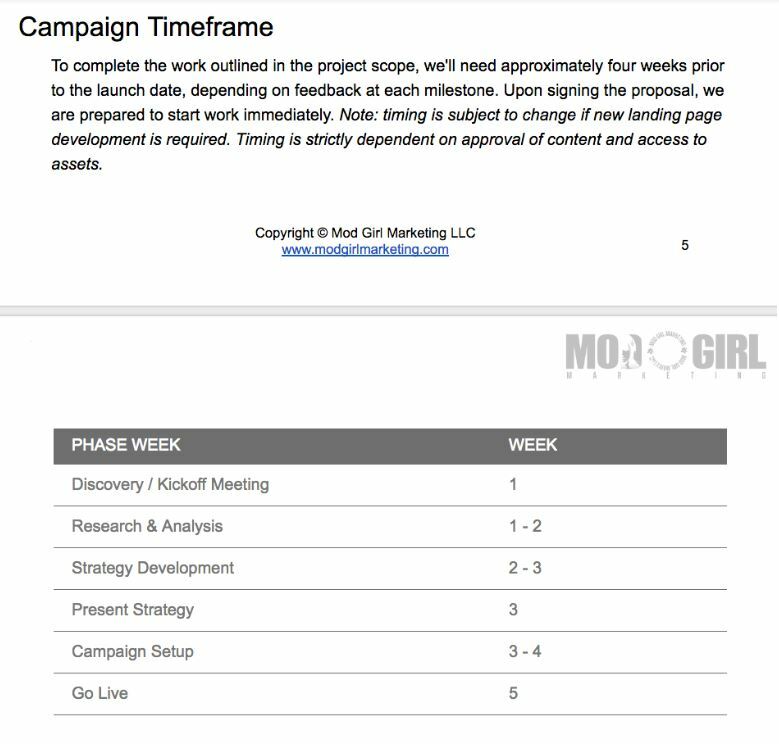 At Mod Girl Marketing, I’ve created a marketing proposal template that’s helped me land $10k projects time and time again. Download your free copy today to help you land your next high-paying client! Download my free proposal template here. Or, you can create one of your own. At Mod Girl, we use the free tool TechSini to create an image of the client’s site. Just plug in the URL you want and it’ll create a mockup on that site on a variety of devices. Select “iMac” as the device and “From Front Perspective” as the view angle, then save a photo of the mockup to add to the front page of your marketing proposal. The next part of your marketing proposal is the objective or overview. This should include the prospect’s current, specific goal, which you discussed with them during your discovery call. This is where you answer: What is the MAIN objective for this project? Do they want to increase leads for a specific product or service? Do they need a new website design to increase brand awareness? Do they need to convert more prospects into paying customers via email drip campaigns? Outline exactly what it is the prospect is trying to accomplish — and be specific. Don’t just say “increase revenue” — call out specific services or products that the prospect wants to increase sales for. This should be short and to the point – one to four sentences should do it. 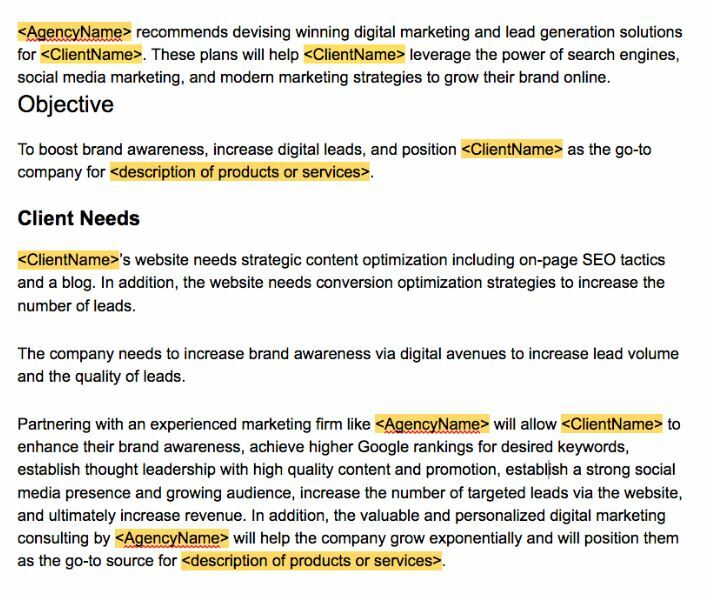 If necessary, you can add a “Client Needs” section to your marketing proposal, where you can go into more detail than you did in the “Objective” section. In this section, you can outline the client’s needs in detail, and outline exactly how partnering with your agency will benefit them. Build the VALUE here. Show the prospect what’s in it for them — why would they want to partner with your agency? If you want to snag my entire $10K proposal template to use for landing your next big project, I made it available for download for free here. This next part of your proposal is incredibly important. The “Scope of Work” or “Scope of Services” section is where you list out what you are going to do for the client. However, you have to walk a fine line when you are listing out the recommended services in your marketing proposal. You don’t want to overwhelm the prospect by listing out every single little detail – but you also don’t want to them to ask a million questions because you didn’t give them enough information about the services you provide. This section depends a great deal on what you are proposing. The more complex or in depth your recommendations, the more information you will need to provide in your proposal. If you are providing a simpler service, you will not need to list out this much. At the end of the day, the prospect needs to know what you are doing for them and what benefits they will gain by working with you. They don’t need a novel explaining every last detail of the services you will provide – focus on the big picture. I prefer to put the timeline after the “Scope of Work” section, but you can include it earlier if you want – it all depends on your preference and the type of engagement you are quoting. What’s important is that you include a timeline so your prospect knows what to expect and when to expect it. Part 6 is the answer the the big, fun question: “How much is this going to cost?” This is where you list out, very simply, how much your services will cost your prospect. Do NOT overcomplicate this. Make it as easy as possible for them to understand. And make sure the payment terms are crystal clear. For example, if you require a 50% deposit before beginning work and then the remaining 50% at the end of 30 days, make sure that is clearly outlined in this section. For agencies quoting multiple services, make sure you line item everything. Unless you are only quoting one service, you should not lump everything into one line. By bundling multiple services into one line, not only does it look more expensive to the prospect, but it increases the chance for scope creep – something you definitely do not want. Speaking of scope creep, it’s always important to add an asterisk to your “Investment” section that states your hourly rate for any tasks that fall outside the scope of work. By the time you send a marketing proposal to prospect, they should already be familiar with you and your brand, since you had a discovery call with them in Step 2. However, it’s always a good idea to further build trust and establish your expertise in the marketing proposal. If possible, screenshot a few relevant client testimonials and include them in your proposal. 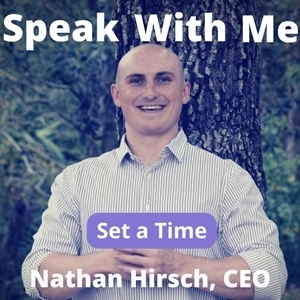 To wrap up the marketing proposal, you need to tell your prospect what the next step is. Keep this simple. Official agreement will be provided and digitally signed upon acceptance. Please let me know if you need any additional information or have any more questions. We look forward to working with you soon and helping you XYZ. Finally, you will need to send your prospective client an agreement after they commit to the proposal. This agreement should include an NDA plus early termination clauses to protect you and the client. To reduce overwhelm, send this after the client says yes to the proposal. Since you’ll review the proposal with them on the phone, you can easily include this as part of your follow-up email after the strategy review call. 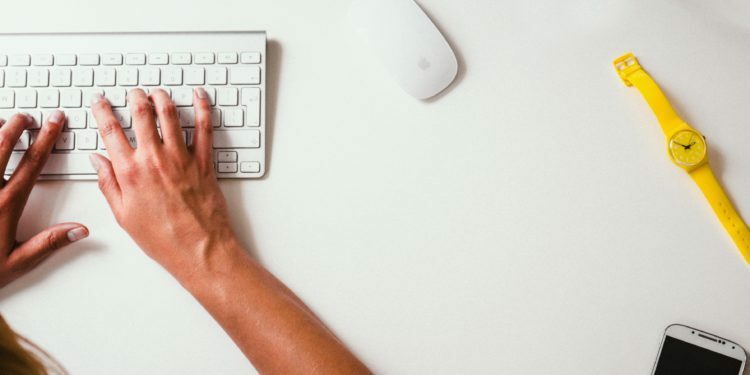 If you’re creating a new proposal for an existing client who already signed an agreement, you may not need to send them another agreement – as long as your first agreement covers the basics. 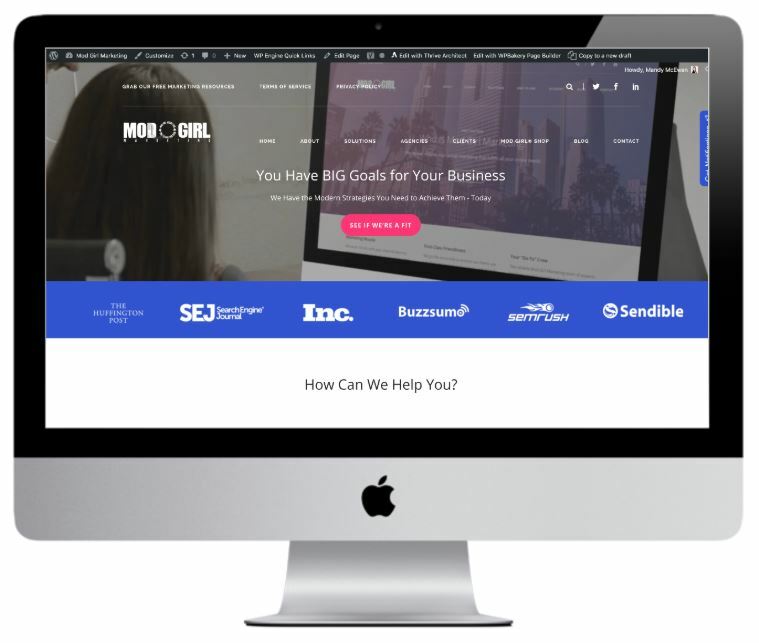 Now that you know the essentials to a winning marketing proposal, you may be wondering if you can just swipe Mod Girl’s proven proposals, decks, agreement templates, lead gen funnels, and everything else we use – and the answer is yes! 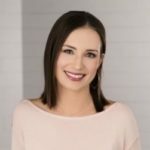 I love sharing everything I know and all of my resources with fellow marketing entrepreneurs, which is exactly why I created my membership Remote Agency Society. In addition to giving Remote Agency Society members access to everything in the Mod Girl vault (including our lead gen strategies, funnels, and templates), I go live every single week and host Mastermind sessions for our members. I review their campaigns, give them live feedback, help them with pricing and sales, and answer any other questions they may have. I also bring in industry experts to provide exclusive trainings and resources for our members. So if you’re ready to partner with me to scale your agency faster, watch my free Masterclass to discover my entire lead gen funnel process and get an opportunity to join Remote Agency Society. This post was contributed by Mandy McEwen of Mod Girl Marketing.